The quote is anonymous. It is lettered in Italic and is printed on an Indian paper with inclusions of multicolored silk threads. 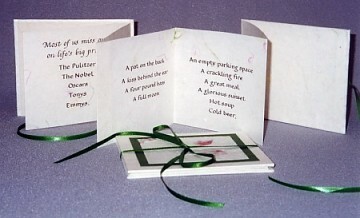 The format is accordion fold. The binding is various Indian papers, one with bougainvillea petals in it. Book 3¾″ x 4¾″ (9.5cm x 10.8cm).